Hemostasis: Prevents loss of blood in three phases: - The vascular phase: Immediate temporary closure of a blood vessel by contraction of vascular smooth muscles. 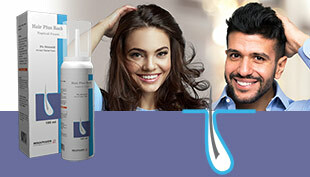 - The platelet phase: Formation of a platelet plug by platelet adhesion and aggregation . - The coagulation phase: For a large blood clot formation by the network of fibrin from fibrinogen. A large number of steps involving many factors are required, some of which require thrombin and Ca++. Active principle: etamsylate Etamsylate 500 mg. Anton. (E 221), excipients q.s. 1 tablet. In surgery: Prevention and treatment of pre- or postsurgical capillary hemorrhages in all delicate operations and in those affecting highly vasculansed tissues: E.N.T., gynecology, obstetrics, urology, odontostomatology, ophthalmology, plastic and reconstructive surgery. In internal medicine: Prevention and treatment of capillary hemorrhages of whatever origin or localization: hematuria, hematemesis, melena, epistaxis, gingivorrhagia. In gynecology: Metrorrhagia„ primary or IUD-related menorrhagia in the absence of organic pathology. Adults: Pro-surgical: 1 tabiet 1500 mg) 1 hour before surgery Post-surgical:1 tablet 1500 rng) every 4 - 6 hours as tangos the risk ol bleeding persists. Internal medicine: Generally 1 tablet 2- 3 times a day (1000- 1500 mg) to betoken with meals with a little water; treatment duration depends on the results obtained. Gynecology, meno-metroffhagia:1 tablet 3 times a day (1500 mg) to be taken with meals with a little water. Treatment lasts 10 days and starts $ days before the expected onset of menses. 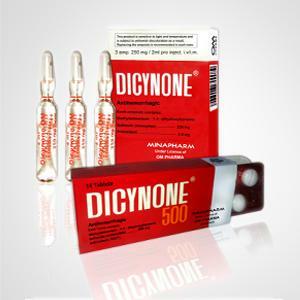 Children: Because of its high concentration of active principle, Dicynone 500 is not appropriate for children. Is Dicynone safe in patients taking Asprin?